Pioneer. Congressman. Martyr of the Alamo. King of the Wild Frontier. 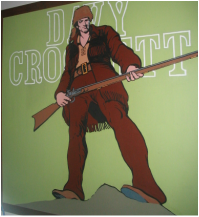 Like all great legends, Davy Crockett's has been reshaped again and again by historians and popular storytellers. In fact, there are three distinct Crocketts: the real David as he was before he got famous; the celebrity politician whose backwoods image Crockett himself created, then lost control of; and the mythic Davy we know today. In the road-trip tradition of Tony Horwitz and Sarah Vowell, Bob Thompson follows Crockett's footsteps from his Tennessee birthplace westward across the state; to Washington, where he served three terms in Congress; and finally to Texas and the gates of the Alamo, seeking out those who know, love, and are still willing to fight over Davy's life and legacy. Read a Q&A with Bob Thompson. BBC features Davy on "Picture This"
It's a running joke in the Thompson family that I can relate any subject at all to Davy Crockett. After three years reporting and writing about him, I think this is almost true. 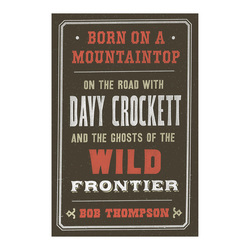 So it seemed like a good idea -- if only to create space for other topics at the dinner table -- for me to channel my continuing fascination with the King of the Wild Frontier into the Davy Crockett Blog. Another plus: The blog lets me share photos of some great stuff I ran into while following Davy around. The above portrait of Crockett standing tall, for example, is in the visitor center at David Crockett State Park in Lawrenceburg, Tennessee. Lawrenceburg was central to the real Crockett's story -- among other things, it's where he launched his political career -- but people there still joke about how the Disney TV series showed the town as a mere dot on a map illustrating Davy's route west. For more on The Town Walt Disney Forgot and other Davy-related topics, you can read the Crockett blog here, or check out Born on a Mountaintop on Facebook.